On this date in 1945, British hangman Albert Pierrepoint executed eleven guards of the Bergen-Belsen concentration camp and two other Nazis in occupied Hameln. Liberated only eight months before these hangings, Belsen provided the to-us-familiar store of Nazi atrocity stories. Forty-five sat in the dock at the Belsen trial under British military authority, including the notorious camp commandante Josef Kramer — better known as the Beast of Belsen — and the “Angel of Death” Irma Grese. On December 13, 1945, Pierrepoint hanged Grese; then, Elisabeth Volkenrath; and then, Juana Bormann, each individually. Finally, the men were then dispatched in pairs. Of all this batch, Irma Grese, the “beautiful beast”, enjoys the liveliest afterlife. If one finds her pretty, then she was a pretty young thing — only 16 when she hitched herself to the SS; turning 22 during her fatal postwar trial. Stalking the camp with her whip, and (rather conveniently) cited with the ravenous sexual appetite a B-movie screenwriter would give such a character, part of her siren song is plainly the fetishistic magnetism of Nazi women. 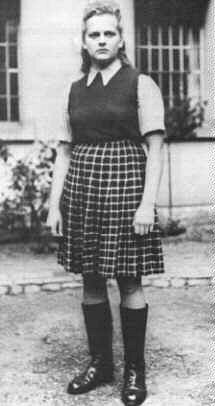 But in the numerous discussion threads about Irma Grese, any number of her advocates will emerge. Can we leave it at the fascination that female war criminals inspire? Certainly few 22-year-old Einsatzgruppen men have the mitigatory evidence of a coming-of-age in farming and retail so lovingly emphasized, the precise measure of complicity in genocide analyzed in such detail (pdf). Grese, perhaps, strikes as impressionable, in the youthful sense of absorbing one’s place from the world one inhabits. Her hangman wrote that “[s]he seemed as bonny a girl as one could ever wish to meet.” As a camp guard, she wins promotions; to her interrogators, she accepts responsibility equal to Himmler’s; among those condemned at the Belsen trial, she alone is defiant. In that guise — and whether or not it is rightly attributed to her — she presents back to her interlocutor those timeless questions of personal identity and moral responsibility: where does abnormal psychology leave off into perfectly conventional psychology that just happens to occupy an abnormal world?